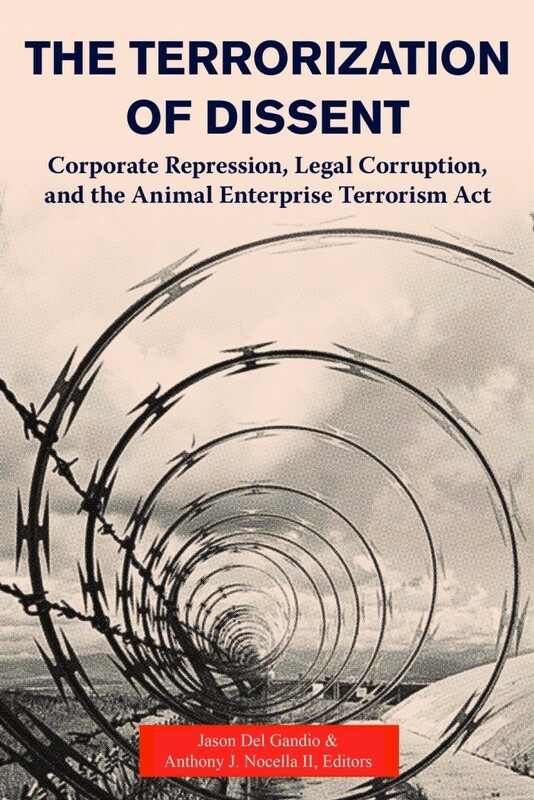 “Terrorization of Dissent: Corporate Repression, Legal Corruption, and the Animal Enterprise Terrorism Act” is a new book examining the AETA and how it threatens the right to protest. When I testified before the U.S. House Judiciary Committee about the Animal Enterprise Terrorism Act in 2006, I argued that such sweeping legislation criminalizes First Amendment activity, whistleblowing, and nonviolent civil disobedience as “terrorism,” and would have a chilling effect on free speech. Members of the committee, including Rep. Bobby Scott (D-VA) and Rep. James Sensenbrenner (R-WI), dismissed my concerns and promised that the law would only target property destruction and violence. Since that time, the true scope of this legislation has been exposed by prosecutions, uncovered FBI documents, and new campaigns by industry groups. It has become undeniably clear that members of Congress were either duped by corporations and the FBI or they intentionally lied to the American people about their intentions. The true targets of the AETA are not arsonists or underground activists. Instead, the people most at risk are undercover investigators and aboveground activists. Even more disturbing is the fact that the FBI Joint Terrorism Task Fce has kept files on activists who expose animal welfare abuses on factory farms and has recommended prosecuting them as terrorists. This information was revealed in documents that were uncovered through the Freedom of Information Act (FOIA) and has been reported on my website, GreenIsTheNewRed.com. The 2003 FBI file details the work of several animal rights activists who used undercover investigation to document repeated animal welfare violations. The FBI special agent who authored the report said they “illegally entered buildings owned by [redacted] Farm . . . and videotaped conditions of animals.” The animal activists caused “economic loss” to businesses, the FBI says. And they also openly rescued several animals from the abusive conditions. This was not done covertly in the style of underground groups like the Animal Liberation Front; instead, it was an act of nonviolent civil disobedience and, as the FBI agent notes, the activists distributed press releases and conducted media interviews taking responsibility for their actions. The FBI file, it should be noted, was dated 2003. That is three years before the Animal Enterprise Terrorism Act was passed. In other words, the FBI argued that such prosecutions were possible under the previous and narrower version of the law. If that was the case, why was the AETA even necessary?) The FBI knew that the existing law was already vague and overly broad, but joined industry groups in grasping for even more power. In recent years a legislative trend has developed that, prior to the AETA, I never would have thought possible. More than a dozen states have considered legislation that explicitly criminalizes undercover investigations by nonprofit animal welfare groups like the Humane Society and Mercy for Animals. At the time of this writing, Iowa and Utah have passed “Ag Gag” bills into law, and others are expected to follow. These investigations have exposed systemic animal cruelty at factory farms, and completely changed the national dialogue about animal agriculture. The video footage has led to criminal convictions in Iowa, voter referendums in Florida, and consumer outrage at the most egregious animal welfare abuses. The threat that they pose to factory farming is unmistakable. When a California slaughterhouse was shut down for egregious animal welfare violations, industry groups put pressure on Congress. Three lawmakers then sent a letter to the USDA urging the department to take action against “the onslaught of attacks” by animal welfare groups. This is the political climate since the passage of the AETA. In the years after it was signed into law, industry groups and law enforcement have only grown more ambitious. There has been a widening of the net, which risks ensnaring more and more activists as “terrorists.” Such repression of political activists is certainly not new; for instance, the FBI used both legal and illegal tactics against civil rights, antiwar, and other activists during COINTELPRO in the 1960s. But in post-9/11 America, the power of “terrorism” rhetoric, combined with corporate efforts to manufacture and manipulate government repression, has created a unique and incredibly powerful culture of fear. However, the political climate within the animal rights movement has changed as well. During the 2006 hearing, I testified as the only opposing witness. The vast majority of activists were completely unaware of the legislation, and most organizations were unwilling to speak up about it. This chilling effect still exists, in many ways, but the movement’s response has radically changed. The Center for Constitutional Rights is challenging the Animal EnterpriseTerrorism Act on behalf of activists who have felt silenced. A diverse coalition of animal, environmental, civil liberties, and legal organizations is fighting Ag Gag bills across the country. This current collection of essays—written by activists, lawyers, and scholars, and finely edited by Jason Del Gandio and Anthony J. Nocella II—adds critical voices to the growing chorus of opposition. It should be viewed not as a historical examination, but as a contemporary toolkit. The authors chart the legal and political history of the law and include the personal stories of those affected. These texts should be read with the understanding that this repression is dynamic. The AETA, as a legal-and-corporate tactic, is expanding to other social movements, and it is evolving as it appears internationally: Corporations have ushered in nearly identical crackdowns in Austria, Spain, Finland, and many other countries. This book is a toolkit not just for animal rights activists, but for all social movements around the world who are effectively challenging corporate power, and who want to better prepare themselves for the backlash that is an inevitable part of that struggle. Next post: #AgGag Victory in Australia!